Good Friday morning, and welcome! It's the end of another week, but the beginning of a fabulous blog hop! Today starts the Blog Challenge Blog Hop, and it won't end until October 1st. What you might ask is that? Well, 13 challenge blogs have gotten together to present this Blog Challenge Blog Hop. Each challenge blog along the way will have challenges for you to participate in and they're offering amazing prizes!! 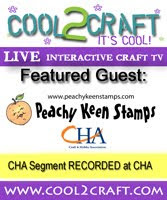 Peachy Keen Stamps is one of the challenge blogs participating, and I am thrilled to have a card to share with you made with one of my favorite Peachy Keen stamps. Snowmany Thanks is the name of this set, and I absolutely love the sweet expression on this adorable snowman. I also LOVE that twiggy hair! Every time I see this image it makes me smile!! Here's a little closer look. The sparkle shows up a bit better when you get in close. Gotta have that bling!! *wink* I used my SU inks and an aquapainter to color this image, and my circle nesties for the circle and scalloped circle. The new Fancy Tags Nestabilities are my new best friend, and I used the largest of the three to cut the tag for the sentiment. After cutting the tag, I sponged some Tim Holtz Vintage Photo distress ink over the surface before I popped it out of the die, and I distressed the edges of the snowflakes with it as well. Finally I added some dazzling diamonds glitter for bling, and some half back pearls for dimension, and VOILA!! Please be sure to head over to the Peachy Keen Stamps Challenge Blog to check out all the wonderful creations the design team has created, and welcome our two very talented guest designers, Emma and Lauri! You'll find all the details about the blog hop there, and check out that Blog Candy!! Play along with the challenge and get YOUR name in the hat to win!!!!!!!!! Thank you so much for stopping by today, and I wish you a glorious day filled with everything that you love!! Happy Stampin'!! OMGosh this is just stunning! You didn't miss a detail when you created this. From the paper to the dots on the scarf and oh that lovely glitter on the snowflakes. This is wonderfully fabulous card! Oh and the twig hair...that is the best! How could you not smile at this card. Lorie, this is divinely cute!!! Love that sparkly happy snowman - such a joyful and joyFILLED card :) What a terrific holiday image and paired with all the lovely things like your dsp & dazzling glitter - such a beauty! (I wonder if that's what Edward would look like as a Snowman, TEE HEE!) Love ya! Lorie, your Peachy Keen cards are some of my favorites to see... so cute and done up to perfection!!! Jaw-droppingly gorgeous as usual Lorie!! Pure gold in fact. How did you get the dots on the scarf? I DO so love this card. You ARE clever. This snowman is so adorable! You have a way with your coloring that just bring the images so much warmth and cuteness! I love your card! Lorie I am always amazed at your coloring! Beautiful design, too!!! PK is lucky to have you on their team! You continue to wow me, Lorie! Just when I think my jaw can't drop any further...this is beautiful and I LOVE the sparlies!